Eye On Sports Media: Has The NFL Heard of The Fair Use Doctrine? Has The NFL Heard of The Fair Use Doctrine? Cris Collinsworth of NBC Sunday Night Football and Showtime's Inside the NFL was in the spotlight last week. It was not for stellar play calling, but because of a 25-year old video clip from a NBC Sports NFL broadcast. The clip featured Collinsworth talking about his approach to dating. 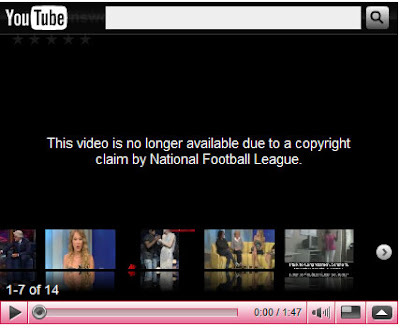 The clip is now gone from YouTube because the NFL asserted its ownership via copyright. and had the Cris Collinsworth "dating" video clip removed from YouTube. In all, the clip was originally one minute and 47 seconds. In isolation on YouTube, the NFL was certainly within its rights to have the video removed. But in the grander scheme of things, the video offered perfect context for discussion of changes in society and how the seemingly innocent comments, in the context of time and societal mores, can come back to haunt someone even 25 years later. So I wonder what the NFL would do if I posted the video on this site, in the context of a larger long form article discussing the issue in a larger context? Since their lawyers are bigger than mine, I think I might pass this time around. At the same time though, I wonder if fear through intimidation and the monopolistic hold the NFL has on their media collateral makes everyone cower when presented with a take down notice.